Hi friends! Today I am sharing a tutorial on how to make a set of quick placemats - 6 in fact from 2 yards of fabric. These are fun for a colorful touch to your dining table, special mats for the kids or even as a gift in a hostess basket. 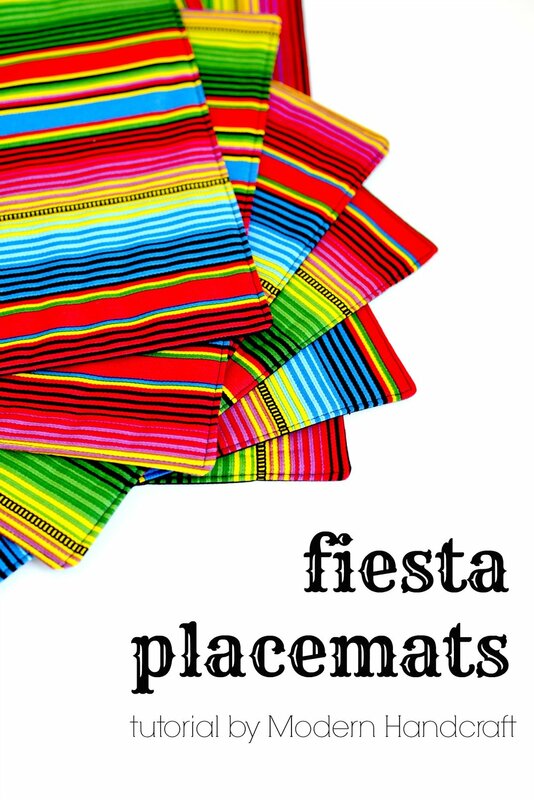 I called these "Fiesta Placemats" because they are made with a super festive fabric and with all of the colors used can fit in with almost any party. 1 yard of Therm O Web Fusible Fleece, cut into 6 pieces measuring 13" x 18"
Take your 6 top pieces measuring 13" x 18" and iron them to your 6 Fusible Fleece pieces - back of fabric to sticky side of fleece. Lay your 6 backing fabric pieces on top of your front fabric/fleece pieces right sides facing. Pin around perimeter and sew leaving a 4" - 6" hole to turn right side out. Turn right side out, poke out corners with a knitting needle or chopstick and iron. Fold your opening pieces under and iron, this will help when you sew the opening closed. Back at your machine, stitch around the perimeter, also stitching the opening closed. I like to use a walking foot from here on out - makes for a nice edge stitch like shown and also helps when you sew across the placemat (keeps the fabric from bunching up). You now have a nice new placemat, if you do not plan on washing these you can leave as is. If you plan on washing you will need to sew a few lines across the top to secure the fleece to keep it from possibly shifting in the wash.
A few sewn lines across the top do a nice job of keeping everything in place. I hid mine in some of the black lines the fabric offers. That's it! Wasn't that easy? You now have a set of 6 placemats for your next fiesta - or Sunday night dinner at home. I love the colors in this fabric - wouldn't a chair covered in this be crazy?! Rolling these up with some fun twine makes for a lovely presentation in a gift basket as well. Perfect for a Mother's day basket of goodies! Hope you have enjoyed today's tutorial and I hope that you will share any finished projects with me that this inspired! I love to chat over on Twitter and on Instagram - come and say hi!